The estimate of the number of open, unfilled construction sector jobs was revised significantly higher for the month of June and remained elevated in July. While hiring and separations increased for the sector, the current count of unfilled construction jobs is among the highest since 2008. According to the BLS Job Openings and Labor Turnover Survey (JOLTS), the number of open construction sector jobs for June was revised up from 127,000 (on a seasonally adjusted basis) to 152,000. The June count of unfilled construction jobs was the second highest since May 2008. The July estimate posted a small monthly decline to 140,000. However, the combined June and July count of unfilled sector jobs is among the highest two-month totals since mid-2007. December and November of 2013 reached similar levels. On a three-month moving average basis, the open position rate for the construction sector increased to 2.27% for the month of July, marking the second month of increase in the rate after a (relative) soft patch earlier in the year. Monthly gross hiring in construction spiked in July, increasing on a seasonally adjusted basis from 268,000 in June to 366,000, the highest month since February 2013. The hiring rate, as measured on a three-month moving average basis, increased to 5.2% in July. Total separations for the sector also increased on a non-seasonally adjusted basis in July, although some of that increase was consistent with recurring seasonal patterns. Two trends in the construction sector are worth noting. First, the layoff rate for the sector (graphed above as a 12-month moving average) has decreased significantly over the last few years. Second, the sector hiring rate has declined noticeably since the fall of 2013, although it has posted some gains recently. 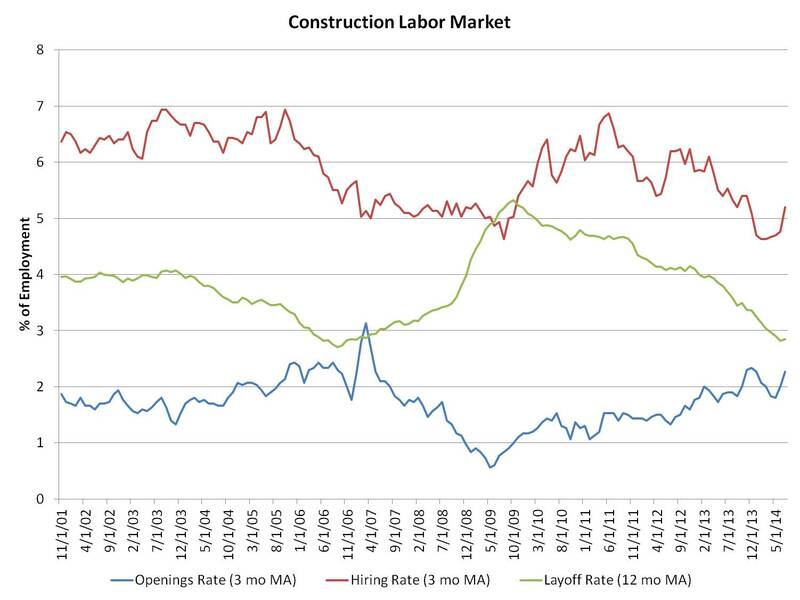 The overall trend lines over the last two years – a falling hiring rate, an elevated open rate, and a declining layoff rate – are consistent with some construction firms having trouble employing workers for specific projects. It is also worth noting that, on a seasonally adjusted basis, the construction sector unemployment rate came in at 9.2% for August (one month ahead of the JOLTS data), down from 10.8% a year ago. Construction sector unemployment peaked at 22% (seasonally adjusted basis) in February 2010. 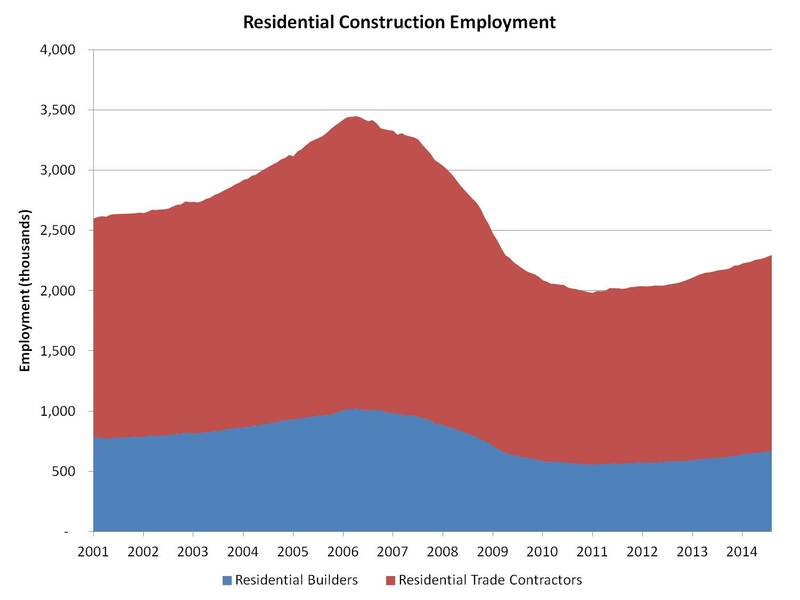 Monthly employment data for August 2014 (the employment count data from the BLS establishment survey are also published one month ahead of the JOLTS data) indicate that total employment in home building/remodeling stands at 2.297 million, broken down as 671,000 builders and 1.626 million residential specialty trade contractors. Over the last year, the residential construction sector has added 123,000 jobs. Since the point of peak decline of home building employment, when total job losses for the industry stood at 1.466 million, 313,600 positions have been added to the residential construction sector as of August. Over the last six months the home building and remodeling industry has added on average about 10,500 jobs per month. For the economy as a whole, the June JOLTS data indicate that the hiring rate increased to 3.5% of total employment. The hiring rate has been in the 3.1% to 3.5% range since January 2011. The overall job openings rate held at 3.3%, matching the highest rate of open jobs for the overall labor market since 2007. This signals good news ahead for job creation.